On the eve of International Women’s Day, the United Nations has launched the “He for She” campaign urging men to stand up for the rights of their mothers, sisters and daughters, while top UN officials stressed that human rights for girls and women are not a dream but a duty of all. “Throughout the world, discrimination against women and girls is rampant, and in some cases getting worse. But we also know equality for women is progress for all,” Secretary-General Ban Ki-moon said, quoting the theme of this year’s observation. With this in mind, the UN at a special Headquarters event today launched the “He for She” campaign urging men and boys to take a stand. Today’s launch features video clips of prominent men urging support for gender equality, including Mr. Ban, Nobel Laureate Desmond Tutu and actor Antonio Banderas. “I think that it is important that women celebrate themselves, but also it is important that they don’t only speak to each other, preach to the converted, that women go out there and we win more allies for our struggle,” Ms. Mlambo-Ngcuka stressed in a new interview with UN News Services. Next year will mark 20th anniversary of the landmark World Conference on Women. The Beijing Declaration and the Platform for Action, adopted unanimously by 189 countries, is considered the key global policy document on gender equality, addressing critical areas such as women and poverty, violence against women and the human rights of women. The next year will also be crucial as it marks the target date for the achievement of the global anti-poverty targets known as the Millennium Development Goals (MDGs), which contain specific benchmarks for gender equality. Countries are also working toward the adoption of global development agenda beyond 2015. 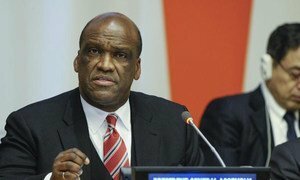 “As we begin crafting a new development agenda for the post-2015 era, we can celebrate the world’s recognition that gender equality and women’s empowerment must be at the heart of sustainable development,” said John Ashe, President of this year’s General Assembly. He added that women and girls take their rightful places in the new development paradigm not only because it is critical for development, “but because equality is their right”, and stressed the importance of addressing root causes of gender inequality. Mr. Ashe also highlighted the importance of ensuring women’s right to sexual and reproductive health. Mr. Ban, who returned to New York earlier today from Sierra Leone, met yesterday in London with Fahma Mohammad, part of the Integrate Bristol campaign against female genital mutilation (FGM) supported by The Guardian newspaper. Mr. Ban had pledged to support her efforts. “Women’s rights, women’s empowerment, and gender equality are essential components of this conversation – including reproductive rights and ending violence against women,” Mr. Ban said. In his speech, the Secretary-General also noted that gender equality and women’s empowerment have been a top priority for him since taking office in 2007. “Today, the top humanitarian official of the United Nations [Valerie Amos], our top development official [Helen Clark], the head of peacebuilding support and the head of peacekeeping support [Ameera Haq], the heads of human rights [Navi Pillay], disarmament [Angela Kane], the Joint OPCW-UN Mission on the destruction of Syria’s chemical weapons [Sigrid Kaag], and the World Food Programme [Ertharin Cousin] – not to mention my own Chief of Staff [Susana Malcorra] – are all women,” Mr. Ban said. Andrea Nunez, Vice President of the World YWCA Board, also participated in today’s discussion. The event was held in the UN’s Trusteeship Council which features a carving of a woman with outstretched arms letting a bird free meant to symbolize an unlimited flight to greater heights. Equality, inclusiveness and participation must guide the framing of the world agenda for sustainable development, the President of the General Assembly said today, urging Member States to ensure that women, young people and civil society participate fully.